Many of you know that I’ve just finished writing my first thriller. During my career as a trade-secret litigator, I was always struck by how fiercely corporations would fight to protect their secrets. Some would do almost anything. So I got to wondering: what if a company would do anything—even kill—to protect its secrets? When investigator (and recovering lawyer) Warren Archer lends his phone to a beautiful stranger, a ruthless corporation marks him for elimination. He must confront the secrets of his past to save himself, the woman, and a city. 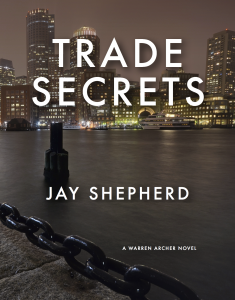 Here is Chapter 1 of Trade Secrets. I hope you enjoy it. Let me know what you think. Send me a tweet or .